About a month ago, I posted about my mason jar lids. At the time, it was a wonderful addition to my mason jar cups. 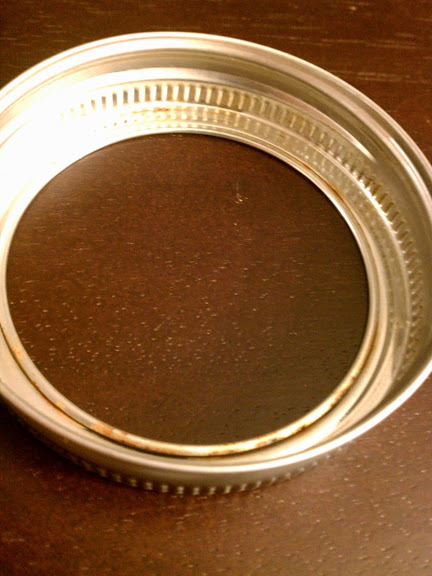 Fast forward a few weeks… frustrated with rust accumulating on the underside of my mason jar rings, I needed to find another solution. At first, I thought that I could, perhaps, just spray them with rustoleum and they would be water tight. Yes, there were flaws in my logic, and admittedly, if I’d thought this one through completely, I would have realized that spraying the insides of my rings with paint was not the smartest solution, but I digress. That clearly wasn’t the ultimate solution. 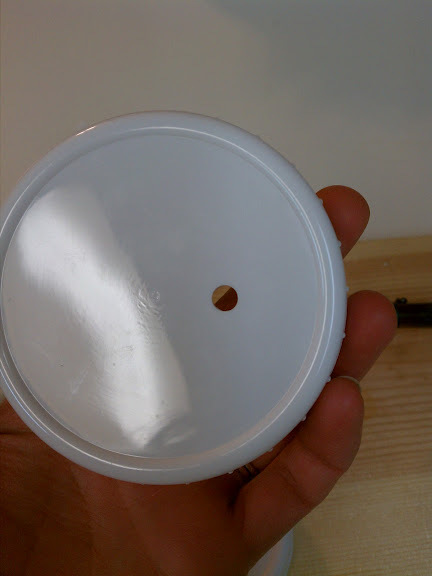 Another option out there is the cuppow lids. I love the concept and idea, but I am not paying $12 (cost + shipping) for a single lid. Not when there are other options available, at least. 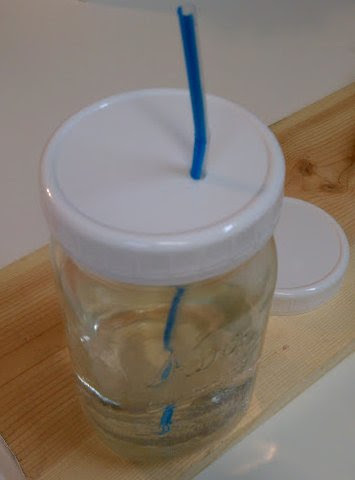 Besides, I think I’ve found the new hotness in mason jar lids… ready for this? The new mason jar lid!! 1. Go to your local grocery/walmart and pick up some plastic canning lids (the ones for storage, not for canning/processing). 2. 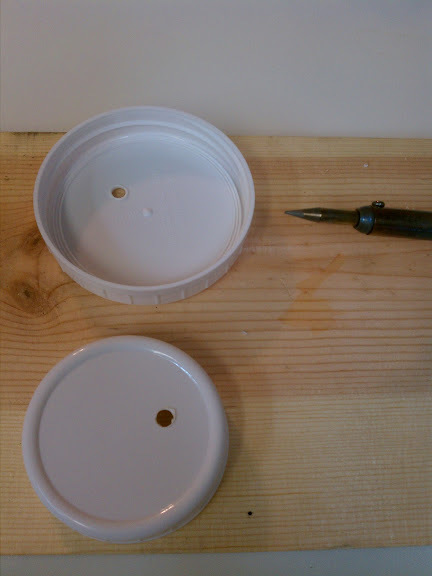 Follow one of the two methods laid out below to put holes in your lids. Because this was (once again) a matter of trial and error, I’ll tell you what not to do first. 1. Pull out your drill. Use a board or something you don’t care about to do this on top of. Figure out where you want your hole to be on the lid. 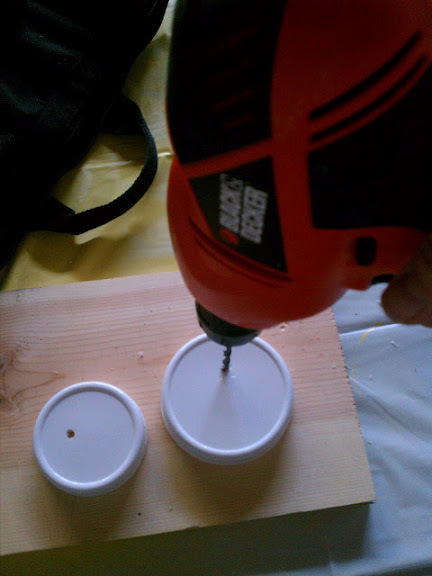 Steady the lid with one hand, the drill with the other. Be VERY careful to keep your fingers away from the moving parts. 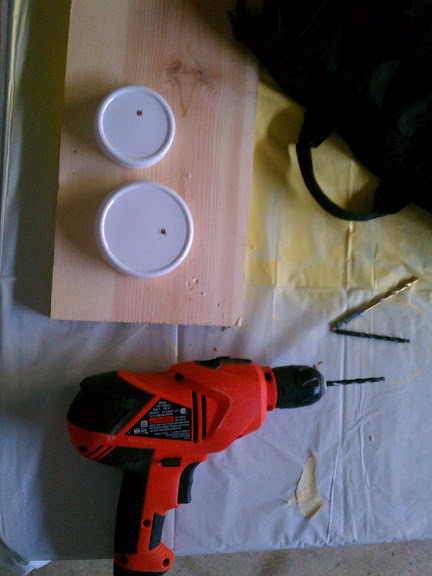 While drilling, the lid will try to spin due to the torque of the drill bit. 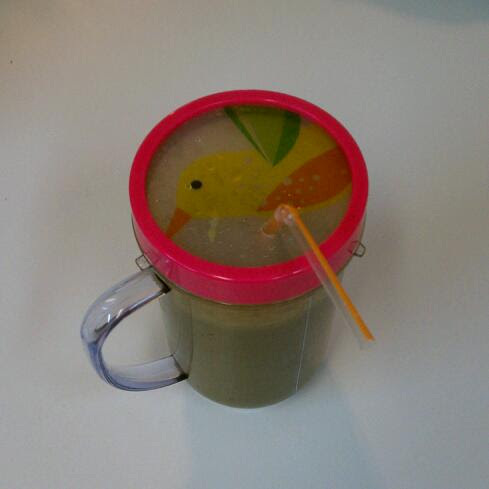 Once you get all the way through, the lid will get a little stuck on the bit and you’ll have to ease it out. Just go slowly and be careful. This method, as I’ve stated previously, is not the best method for adding holes to your lids. 2. Goal accomplished, but the holes were rather messy, and the danger level of this project was about 9.5 (out of 10). Ok, maybe I’m exaggerating, but I wouldn’t do it again this way. I was seriously concerned about bodily harm. Maybe I would have felt more comfortable if I had a vice grip to hold the lid in place, rather than my hand. 3. Ready for drinking, but this is one ugly hole. I tried to pull off the extra shavings the drill left behind, but that just ripped a larger chunk in the top. Not pretty. 1. Heat up your soldering iron. You want it to be good and hot before coming in to contact with your lid. Also, do this project on something you don’t care about that’s NOT flammable. We have a (tiny) black mark on our counter from where the soldering iron may have come in to brief contact with it. Oops. 2. 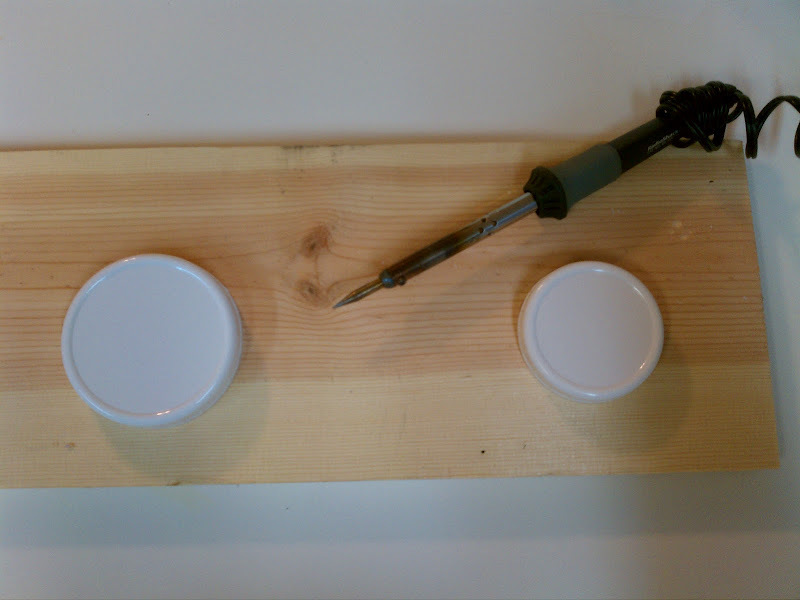 Once heated, push your soldering iron through your lid. I wanted my holes to be about the circumference of the base of the iron, so I pushed it all the way through. Be VERY careful while doing this. Do NOT come in to contact with your skin. Soldering irons are darn hot. There will be a bit of melted plastic still on the iron when you pull it out. I keep a piece of cardboard handy nearby to scrape off any excess, rather than letting it burn off. Just don’t let it come in to contact for too long – cardboard will burn!! Oh yeah, one other thing of note… melting plastic is a hazardous thing. Not good for your lungs, brain, eyes, whatever else you want to throw in there. Be like Bill, and DO NOT inhale. Or just don’t use this method at all. Please don’t do it just because I said I did. I’m not cool enough to have that kind of influence. 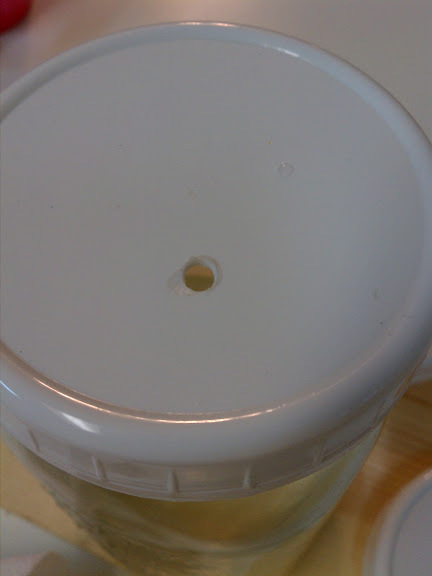 Here’s a tip… to get a perfect, clean hole, melt your hole from the bottom side of the lid. The extra “stuff” will be on the inside and not visible. See the picture above? The top lid was done from the bottom side, and the bottom lid was done from the top side. perfection! hole was started on the inside of the lid. Check out that amazingly perfect hole!! And what of my old mason jar lids? All is not lost. A quick trim and they fit perfectly in my magic bullet cups. Ahh, the circle is complete. I love it when things work out so well. the birdy lives to see another day!